"My, how our standards have changed!" was all we could think after tapping a stranger on the shoulder on a Dubrovnik street and asking her to keep nearly $10,000 worth of bikes and gear in her garage for 4 months. "Care and caution" could be our unspoken motto, which wouldn't seem to fit with the curbside deal we struck. Hauling the newly purchased suitcase is always a challenge. But later a quick discussion highlighted why this was likely a safe bet: we approached her, she didn't approach us; and she and her husband had a small business renting 2 summer tourist apartments. Odds were high that they were upstanding citizens who were willing to grant a favor that didn't put them out much. And granting small favors to foreigners, like a car ride to the port or holding bags, were likely a routine part of their lives as Croatians in the hospitality industry. The graying Dubrovnik-born couple had us in for a drink a week later when we dropped off our bikes, which was no doubt a comforting bonding ritual for all involved. They spoke enough English to permit a pleasant conversation and we exchanged impressions of New York City and expectations of president-elect Obama. After handshakes and a confirmation of e-addresses we were off, without our bikes. We fret a bit each year that we stash our bikes in Europe and each year the arrangement is different: we've rented storage lockers for them in Italy and Spain; once we swung a deal with owners of a small Roman hotel in which they stored our bikes in return for 2 multi-night stays; last year we stashed them in a folk singing society's office in Sicily; and early in our travels we left them with friends of friends in Athens. The formality of the deal or the amount of money that exchanges hands doesn't influence our confidence level that "everything will be all right" as much as we'd expected, so such a causal arrangement as was the case this year in Dubrovnik seemed as good as any. 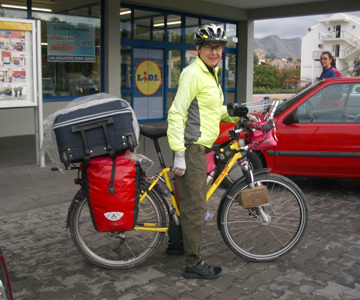 With our bikes, panniers, and some of our gear stowed in a dry, locked place we'd more easily and more cheaply make our annual journey back to the States with only suitcases. Stashing them also eliminated the risk of damage to them or us from all the transport-related handling involved with taking them home. Our ferry cabin bunk beds made for cramped dining quarters. Our pattern of starting and ending our touring season relatively far south in hopes of extending the warm weather portion of our touring season is always a terrible fit with catching our favorite nonstop Lufthansa flight between Frankfurt and Portland. Ending in the south significantly increases the distances required to travel back to Frankfurt in the late fall but not having the bikes with us opens up our transportation options (and reduces the cost). This year we managed to require nearly 2 weeks to complete the 3 travel days from Dubrovnik to Frankfurt. The extra days started out as "just incase the boat/bus/train is late" days which are more likely hazards the farther south you are. The twice weekly, 22 hour ferry ride between Dubrovnik and Rijeka was the first vulnerability and we built extra time into our itinerary for alternate plans should the sailing be delayed or cancelled. That segment would link us with a 2 hour bus ride through Slovenia to Trieste, Italy and from Trieste we'd take a train to a suburb of Venice. And of course, as the planning unfolded, sightseeing days were added. After a few days exploring Venice and some nearby towns we'd catch a non-daily, budget flight to Germany where we scheduled extra days for taking in a couple of special exhibits at museums in Bonn before taking a train to Frankfurt. A break in the clouds for a classic shot of Venice. 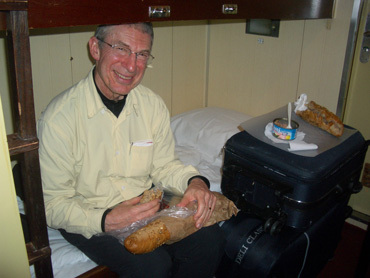 Venice wasn't on the 2008 itinerary until Bill began developing an exit plan in late October to whisk us from the southern reaches of the Balkan Peninsula to Frankfurt. The budget airlines Ryan Air and Easy Jet are the starting point for such planning sessions if we aren't taking the bikes as their fares can be vastly cheaper than any other mode. Indeed, traveling on Day 2 of Ryan Air's free ticket promotion event was a perfect fit with our needs. Of course, free isn't free after all of the extra silly and strange charges but 58€ ($73) for 2 to travel from Venice to Frankfurt was a still a steal and besides, who wouldn't want to go to Venice? We hadn't been there for several years and a stroll through the historic city would be a treat--suddenly Venice was on our schedule and we were delighted. Being greeted in Venice by a drenching downpour around dinnertime signaled the end to our overall good fortune with the fall weather. We only had to deal with the rain in the form of standing water the next morning but the penetrating damp cold under persistent gray skies was too much like being back home. There was no lingering to be had in Venice in the 40°-something temperatures as we could barely keep warm even with being constantly on the move. 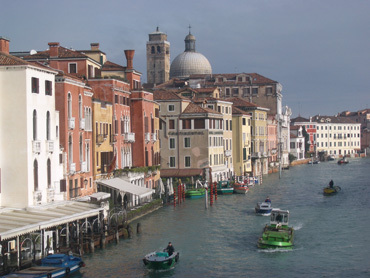 Since we felt like we'd seen the "must do" sights on prior visits, we set-out to explore Venice's extensive periphery. 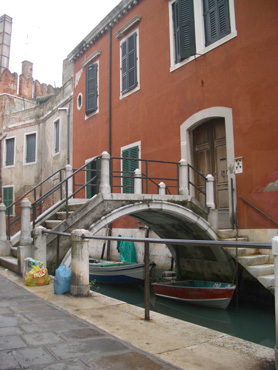 After more than 4 hours of crossing dozens of tiny footbridges linking small streets and alleys through a maze of small canals, we felt like we'd had a tour of "Residential Venice." We'd spotted almost hidden neighborhood markets by watching the locals filter out the doorways with their plastic shopping bags. We'd marveled at the numerous small bridges that only served a single door on a single building and noted the many sitting gardens partially hidden behind iron gates and stone walls. And like elsewhere in Italy, we munched on our tuna and bread while parents totted their children's' backpacks as they escorted them home from school for lunch. None of the surfaces in Venice had the fresh and well-maintained look of their northern neighbors in the Dolomites which were only a few hours away by bus. Instead, everything in Venice was in an active state of decay. Stone and occasionally brick pavers under foot were grooved and worn; walls and statutes in niches had the tilt of drunkenness; and rarely did we see a fresh coat of paint or other signs of ongoing maintenance. 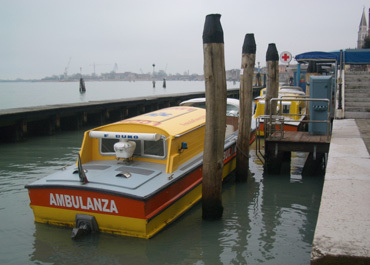 Ambulances lined-up in front of Venice's hospital. Motorboats whizzed by at speeds that appeared to be producing the wakes that we'd heard damaged the foundations of the ancient buildings. And locals slyly avoided scooping or disposing of their pooches poop. The little carelessness's we saw reminded us that it was more than the ravages of untamed nature that were creating the stability problems for historic Venice. In Venice, as in much of the Mediterranean, minimal maintenance is a part of the look that modern mythology as transformed into "charm." However, no longer being property owners made it easier to appreciate the picturesque qualities rather than be distracted by the need for work. As we walked and walked on the stone surfaces we noticed other little things, like the numerous wells--dozens of them--that had been capped. Our technically oriented minds were suddenly ruminating on the challenges of sinking a well through reclaimed land in a saltwater swamp but those musings were added to the long list of unanswered questions we've asked. 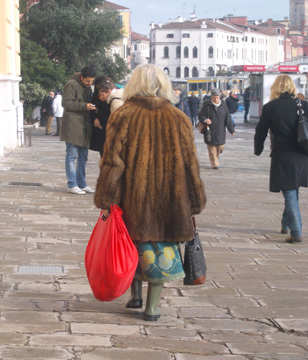 Rubber boots with a fur coat--only in Venice? 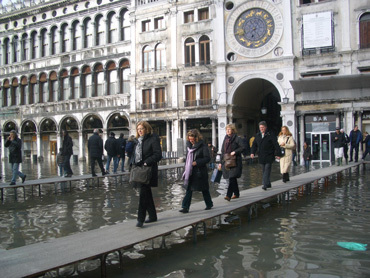 Our second day in Venice was to include a visit to the 2 major nearby islands but high water made that unadvisable. Our suburban Venice hostess mentioned it might be a problem and the number of folks on the bus into Venice that were wearing knee-high rubber boots added weight to her concern. It was hard to miss the point when we arrived in the city as even before we saw the standing water there was a parade of both discrete black rubber boots and others boots sporting bold patterns. Pairs of men here and there were wearing or taking off their hip waders and some tourists were clunking around in ill-fitting, single-use over boots. Though we'd heard of the high water problems threatening to submerge the historical city for years and of the troubles in implementing a permanent rescue plan, we couldn't quite remember what triggered these extreme flooding events. A little study of the technical literature handed out on flooding days by the tourist info folks answered our questions. Overzealous removal of water from the area's aquifers since 1970 had accelerated the long history of general subsidence of the reclaimed land and the effects of both were made worst by a general rising of the sea levels with global warming. What we didn't know was that strong winds, including the bura we'd experienced several times in Croatia, can raise the water level in Venice by over 3'. The winds can literally pile-up the water of the Adriatic Sea at the narrow, shallow, northern end near Venice. Low barometer pressure, high tides, and wind can conspire in various combinations to create exceptional tides that are most likely to occur in October, November, or December. We spent this our second day in Venice again walking for hours along the many canals and backstreets and we were stunned at how unprepared many businesses had been given we were visiting in the peak of "high season" and so the flooding should not have been a surprise. We had no way of knowing if the extensive mopping, sweeping, and sponging up and out of water represented a failure of the municipality's extensive alert system or denial of the severity of the threat on the part of the residents. St Marks as the high water receded. Signs of the clean-up challenges were everywhere in Venice that day and were the same as those anywhere the with additional hazards of the water being salty. 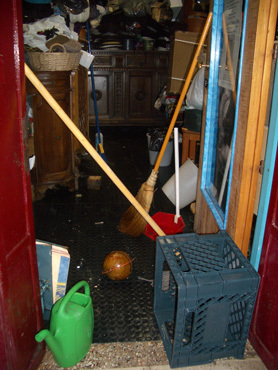 As the tidal waters receded residents pushed the lingering puddles out the door with brooms and squeegees. A few shopkeepers had power washers, steam cleaners, or shop-vacs to aid them. Mops and hand-wrung sponges were used in confined areas or to soak-up the last of the water. Mannequins, shelves, and windows were getting wiped-down and there was little natural drying potential under the cool, gray skies. Presumably it was the corrosive threats of the salt water that were prompting the partial dismantling and meticulously cleaning of the metal on the lower portions of some door mechanisms and floor plates. Peeking-in on the mopping up mess. The stone pavers and some walls had high water lines demarcated by bits of garbage and grit and urban garbage was floating in the canal waters. Thoughtful residents had tied or hung their household garbage up above the high water line on what must had been collection day. One of the aggravations and ironies of travel was that it was the next day--when we were in Germany--that we first heard we'd splashed around in Venice's worst flooding in 20 years. Then we knew that the residents hadn't ignored the threat nor had the alert system failed but instead the flooding within the shops was because it was an extreme event. And it was indeed the product of a typical combination of a high tide and strong winds though we hadn't noticed exceptional winds in our area. "Ahh...." there is always a sigh of relief when we arrive in Germany as it is so reliably comforting. It was in Germany that we would get more information in general and indeed, it was where we heard the rest of the story behind the floods we experienced in Venice. And I knew that after days of endless walking in and around Venice--walking that was in part just to keep warm--that we'd now be comfy in Germany despite the snow. The layer of white on the ground at the suburban German airport when we arrived spoke of colder temperatures than in Venice but at least the indoors spaces would be warm. So often in the Mediterranean lands the shopkeepers have the doors wide open in the winter and many cafe clients bravely sit outside sipping their favorite hot or cold brews while we stride on by trying to shake a chill. But not in Germany: the doors would be tightly closed and the heat would be on. Our budget airport hotel room in Germany was warm in minutes after we arrived around midnight whereas it took a full 24 hours to release the chill from our ground floor, Venice-area B&B room. At last we knew the hot water would be hot, the windows and doors would be tight enough to keep the drafts at bay, and the furnishings would be pleasing. I cataloged the familiar pleasures of being in Germany while under the shower and briefly pondered "Why would we go anywhere else?" but quickly remembered the view out our window of the light snow being blown at a near-horizontal angle. The continental satellite report on TV reminded us that all of Europe was under siege and the Balkans that we'd just left was being hit the hardest. It was lousy weather to be a tourist anywhere in Europe so just as well to have the cozy indoors spaces of Germany to sooth us between chilly bouts outdoors. 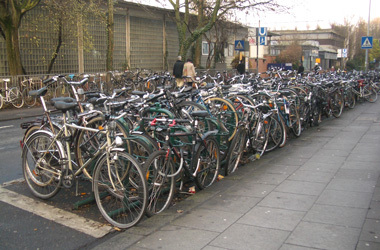 Bike parking outside of Bonn's main train station. Several hours on a bus and then train were required to deposit us in Bonn from the suburban-Frankfurt airport and we quickly settled-in for our 5 night stay. It didn't take long in the country to be reminded that it is also the abundance of things that is so welcoming. The abundance starts with the little things--like enough toilet paper in our room--and grows from there. The ample space on the sidewalks for pedestrians, the vast networks of bike lanes, and the thousands of bikes echoed the theme of plenty. The abundance of merchandise in the German stores also adds to our sense of ease. We aren't "shoppers" but it is a treat to know that we'll readily find what we want should we have a need. In contrast, in Croatia there are some things we just can't buy and with other items the range of choice or quality/price ratio is appalling (like with suitcases). The product range in Italy is probably similar to Germany but retail in Germany is organized in a more familiar way for US visitors than is the case in Italy. In addition to the abundance for shoppers in Germany, the abundance spills over into the "gemutlichkeit" or settings and events that support the pursuit of good cheer and cozy feelings. And gemutlichkeit is especially evident in Germany in December at the traditional Christmas markets. 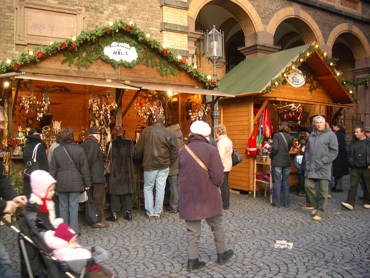 The pedestrianized old town center of many German cities, including Bonn and Frankfurt, become stuffed with charming wooden-chalet styled Christmas booths oozing with holiday spirit. Handcrafted and imported merchandise and food are both big draws. Visitors stand around small tables sipping mulled cider, hot chocolate, and stronger brews. The smell of anise literally being pumped out of candy stalls invariably turns our heads. Holiday pastry treats abound as do the ubiquitous national favorites: sausages and fries. Bundled babies in prams, toddlers in tow, dogs on lead, and adults of all ages swarm the Christmas markets with the primary goal being to have a good time. I love the energy of these markets, which like the evening stroll or "passegiata" in Italian cities, puts the emphasis on the people. Both create environments where an unaccompanied person no longer feels alone. I can walk by myself in these crowds and soak up the collective good cheer. It nourishes me and fills in those places that are only fed by a sense of community. It is a shame that our American culture doesn't have comparable public social traditions where anyone needing a hit of social connection can so readily get their fill so easily by just mingling. Soaking up good cheer at Bonn's Christmas market was one of the pleasures of being there. It was a nice side benefit to our primary mission, which had been to take in the exhibit "Rome and the Barbarians." Bill checks the Bonn museum's exhibition schedule annually and most years we swing through Bonn to enjoy the current offerings before flying home from Frankfurt. This year we bought a 2 day tourist city pass for the first time and also pressed our noses to the glass at "The Lombard's," "Gandhara," and the tiny Egyptian museum associated with the university. Yes, these are obscure topics but we were museum-starved so we enjoyed the change of pace and improving our knowledge of both history and geography. And of course while in Bonn, we walked and walked some more. Without bikes to keep us fit, we had to settle for walking on the very flat terrain of the river city for our exercise. One day I took the public transport to the end of the line and walked back 'home' along the river. Another day Bill picked a large, distant park for us to walk to and to further explore. Lucky for us the only snow we saw was on our arrival day in Germany and the temperatures hovering around 40° weren't accompanied by the bone-chilling dampness of Venice. Our 2 week sojourn from Dubrovnik to Portland went like clockwork. Our 22 hour sailing in the Adriatic from Dubrovnik to Rijeka happened to slip into a 36 hour break between the storms. Every bus, boat, train, and plane we took was on time and made its journey without incident. No baggage was lost, no immigration officials grilled us, and our sorting and packing of belongings had been perfect. The days of "just in case" extra time and contingency plans weren't needed and were instead transformed into leisurely sightseeing. Then it was on to our other life in the States. Our first big event would be getting the laptop repaired promptly so chores postponed for months could resume. And of course, in addition to this anticipated event there would be unexpected things, like unusual weather and the need for an unanticipated move that kept the chaos level high. We are still digging out our backlog of 2008 journals that I 'thumb boarded' on my PDA last fall after our laptop crashed and never recovered. I'd hoped to finish these while we were at home in the States this year but an unexpected move resorted our priorities for us. So, as we begin Touring Season #9, we are continuing to share Season #8 with you. We arrived in Europe on March 12 and after a long jet lag recovery in Kotor, Montenegro, we returned to Dubrovnik by bus. There we picked up our bikes from their "homestay" hosts and Bill used their garage for a day to install most of the new bike parts we brought back with us. A little wobbly, we pedaled out of Dubrovnik 4 days ago. Bill has taken advantage of the short distances between towns along the Dalmatian coast to make our first days short. The first 2 were really short--12 and 18 miles--but each with over 1000' in elevation gain. Embarrassingly, that was enough for our de-conditioned bodies. Predictably, my shoulders and calves complained and Bill's back was cranky from the held-too-long positions he was in while doing the bike maintenance. Strong headwinds on Day 2 and rain on Day 3 made us happy to have an unloaded day ride today on Day 4. We are feeling more comfortable on the bikes and our bulging panniers are beginning to compress with all the jiggling on the road, both of which make life back on the bikes look more possible. And despite the aches and pains, we are both loving being back in the saddle again.